Discipling doesn’t seem like the most obvious way to establish and strengthen a kingdom, does it? Kingdom building is typically the stuff of royal battles, dynastic wars, great fortunes, or works of political philosophy by old men with long gray beards. But Jesus concluded his time on earth by commanding his disciples to make disciples. Is that really how his kingdom would be built? Jesus taught his disciples to live in view not of today or tomorrow, but eternity. We try to help others follow Jesus; we do deliberate spiritual good; we pray for gospel influence; we proclaim God’s words, and we do all this for the sake of the Last Day. Yes, we may see some fruit now. But the goal is always to present people mature in Christ then. What is discipling in addition to helping others follow Jesus? It’s doing them spiritual good. Specifically, it’s initiating a relationship in which you teach, correct, model, and love. Needless to say, it takes great humility. At its core, discipling is teaching. We teach with words. We teach all the words Jesus taught his disciples, and all the words of the Bible. Corporately, this is why my own church preaches expositionally and consecutively through books of the Bible, alternating between the Old and New Testaments, as well as between big chunks of Scripture and little ones. We also encourage people to attend our adult Sunday school program that provides a several-year curriculum through different areas of the Christian life. Once people complete the curriculum, we encourage them to walk someone else through it. Our church also finds lots of ways to promote the ministry of good books. Interpersonally, teaching occurs as people learn to have spiritually meaningful conversations with each other, which is something I as the pastor encourage from the front almost every week. It’s fine to talk about football or the kids’ school. But talk about Sunday’s sermon as well. Ask your friends what God has been teaching you about himself. Small groups can also be useful for facilitating these kinds of relationships. Sometimes discipling requires you to warn others about the choices they’re making. People grow when you teach them general truths, yes, but also when you correct their particular errors. Part of being a Christian is recognizing that sin deceives us, and that we need other believers to help us see the things we cannot see about ourselves. Joining a church, I’ve often said, is like throwing paint on the invisible man. New sins become visible in the course of our discipling relationships. In fact, you can lead in a discipling relationship by inviting others to correct you—and making it easy for them to do so. But you must fear God more than man by being willing to correct others when necessary—and risk their rejection of you for it. Ultimately, the work of correction belongs to the whole congregation, which occurs when a member proves more committed to their sin than to Christ. After multiple rounds of warning, the person will be excluded from membership and the Lord’s Table (Matt. 18:15–20). The vast majority of correction in a church, however, should occur in the private context of discipling relationships. It’s worth noticing Jesus didn’t just command his disciples to teach people. He told them to teach people to obey. The goal of discipling is to see lives transformed, which means it involves more than reading a book or even the Bible with another person. 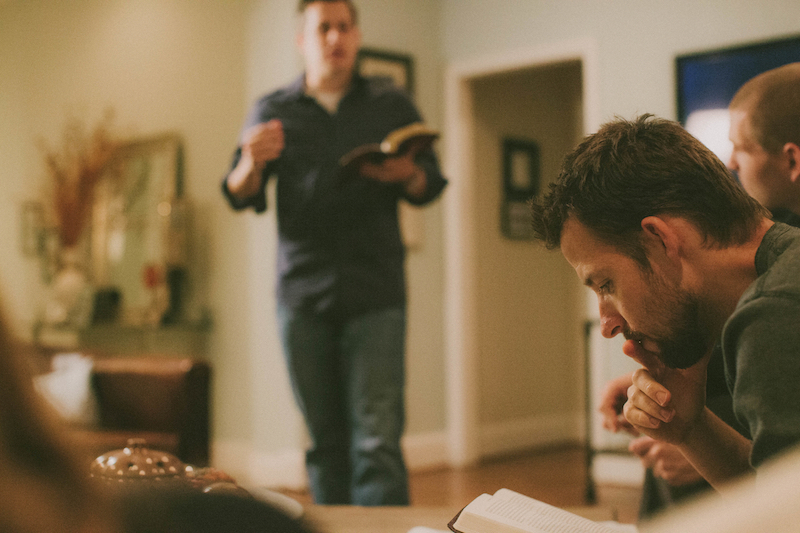 Ultimately, discipling involves living out the whole Christian life before others. Jesus is the ultimate example here; he “left you an example that you should follow” (1 Pet. 2:21). We communicate not merely with our words but by our whole lives. And what happens in a discipling relationship requires more than classroom teaching. It requires the kind of instruction that occurs through an apprenticeship at a job, or with a personal trainer or coach. An apprentice learns by listening and watching and participating, little by little, with more responsibility being earned over time. Most of all, discipling looks like what God designed for the home, where dads and moms teach in word and deed through all areas of life and then draw the children into the work of adulthood. To add a final angle, discipling is a form of mutual love. Yes, there’s something of a teacher-student relationship, but there will also be peer-to-peer mutuality and love, such that the discipling often goes both ways. As one who’s been doing this for a long time, I can say I’ve often been served and blessed and encouraged in the faith by those I’m discipling. Even as I work to do them spiritual good, they do me spiritual good. They help me better follow Jesus. In discipling, my goal is to love younger Christians by helping them live in light of that final Day—but they typically recognize that my ability to do so depends on them helping me to do the same. Christian discipling isn’t so much the work of experts and technocrats; to borrow the old phrase, it’s the work of one beggar pointing another beggar to bread. And the local church is the best place for such relationships to grow. A church can be thick with mentoring relationships even if they aren’t formally called “discipling relationships.” After all, discipling really is just a bunch of church members taking responsibility to prepare one another for glory. It’s one way we see the New Testament idea that we are a kingdom of priests and a holy nation (1 Pet. 2:9). How much pastoring gets done in the ordinary life of a congregation when it’s characterized by a culture of discipling! One last place humility is required comes with the recognition people will sometimes move away. The reality of transience, particularly in many cities, requires us to maintain open-handedness toward those we love. We don’t invest and share and pour and pray and love for what we might receive—other than the satisfaction and joy that comes from knowing they are better equipped for wherever they go next, and ultimately for our Savior’s coming. Editors’ note: Content adapted from Discipling: How to Help Others Follow Jesus by Mark Dever, ©2016. Used by permission of Crossway, a publishing ministry of Good News Publishers, Wheaton, IL.